Egg stew is often mistaken for Tomato Omelette. Both are not quite the same. Yes, they are both prepared with the same ingredients, just not in the same quantities. 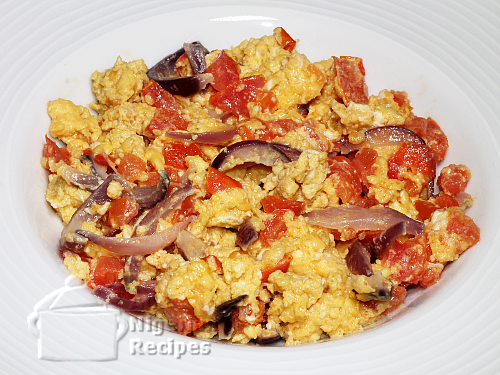 While Tomato Omelette consists mainly of eggs, Egg Stew has more of tomatoes. Also, Egg stew is not "set" like Tomato Omelette. Egg Stew is very easy to prepare and it spices up some Nigerian staple foods. Remove the seeds from the tomatoes and cut into big slices (see video). Also cut the onion into big slices (see video). Beat the two eggs, add a pinch of salt and set aside. Heat the vegetable oil in a pot, when hot, lower the heat to medium. Add the onions and stir for about 2 minutes. Add the tomatoes, stir for a bit and cover the pot. This is so that the tomatoes and onions do not dry up too quickly. Stir from time to time though. After about 5 minutes, add the ground pepper, salt and seasoning. Keep stirring till the tomato is completely soft and separated from the oil. Slowing pour the egg in a circular motion. Do NOT stir. Cover the pot and reduce the heat to low to allow the egg to "cake". You want the egg to form lumps in the stew rather than look mushy.